Creating contacts, building healthy communities, by letting others know when their company would be welcome, starting with a cup of coffee. As an individual, group, or coffee location you can get involved and create contacts in your community. Find out more about this new Social Enterprise believing in face to face conversations. Whilst working on Community Christmas Caroline was frequently told by older people 'I don't want to intrude' or 'I don't want to be too much trouble' and she felt that identifying who would appreciate contact could avoid a lot of frustration. It was also apparent from conversations that younger people really value connections with their seniors. Coffee Companions was born as a Social Enterprise in 2016 to create cultural change where face to face conversations become the norm again. Chat Mats are core to the concept indicating whether someone will appreciate company or not and to help get around the fact that we aren't mind readers. It doesn't require volunteers or club membership or any kind of commitment because it's about anyone, anywhere, anytime having a chat with their coffee if they want to. Chat Champions help extend the concept into communities around the country. Although Coffee Companions is aimed at older people, with families being so spread geographically much of the impact will be through intergenerational contact, and younger people can adopt the concept too. 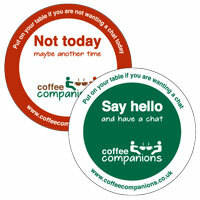 Coffee Companions is for anyone who wants to put down the paper, turn off the phone and enjoy a chat with their coffee. There is research that shows the health benefits of social interaction for individuals, and our communities benefit too. Coffee Companions was started so that people have another way of connecting with their communities without waiting for Christmas.